Solar Window Screens by Bravo. Bug and Insect Protection. 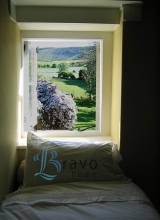 Bravo manufactures the ultimate flexible window screen that will fit any size and shape window. Flexascreen provides you with complete insect and bug protection within minutes. Our screens are an easy DIY measure and install project. Our screens require no tools or professional installation. Within minutes you are enjoying all their benefts. The great thing about Flexascreens is they will no move, blow off, become jarred, break or stretch out over time, like their traditional counterparts. Instead, they are fixed and will not move until you want to remove our them. Flexascreen allow for easy cleaning and maintenance of your windows. Bravo's screen mesh not only provides great protection, but does not detract or obstruct your views. In addition, we offer different mesh options include pet proof mesh and solar-coated mesh fabric. The solar coated mesh gives you solar window screens that will protect you from harmful UV rays. Pet proof mesh will resist any damage that your pet can inflict with their claw. The pet screen mesh will not be damaged because it is seven times stronger than standard fiberglass meshing. Bravo products allow for optimal air circulation, so you can have a cooler and more comfortable living space. Our products can be cleaned by light vacuuming and with using the brush attachment on your vacuum cleaner. Also, you can clean them with a damp cloth and mild soapy water. Bravo products are durable, easy to maitain and affordable. 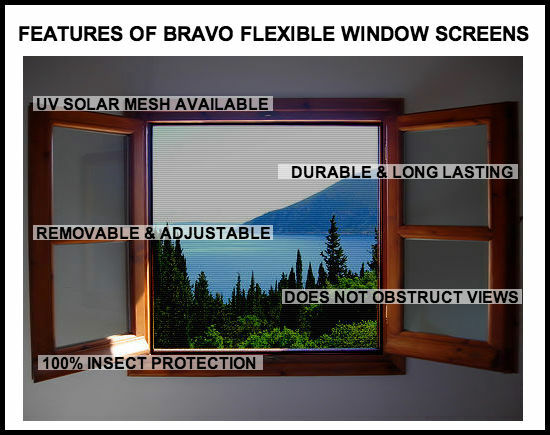 Bravo Flexascreen bug screens are the optimal screen that will met all your needs.